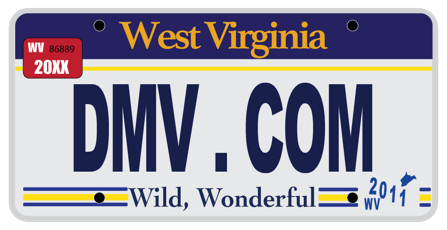 DMV.com was created to help simplify your life by providing you with all the vehicle related information and West Virginia DMV services you may need, in one place. Quickly find information and services regarding driving records, vehicle registration, drivers license renewal, license plate renewal, getting a learners permit, and finding a West Virginia Department of Motor Vehicles approved traffic school. Learn about West Virginia drivers license services provided by the DMV. A WV DMV drivers license is required for residents to drive legally. Requesting West Virginia driving records online is the fastest way to get your driver history. Order a DMV driving record from home today. Find affordable car insurance in West Virginia at our online car insurance center. Auto insurance is required by the DMV for WV drivers. Discover WV online traffic school benefits. Passing defensive driving school in WV may let you dismiss a ticket or get insurance discounts. Take a WV DMV driving practice exam to test your knowledge of traffic laws. Completing a WV DMV practice test can help you earn a license. WV car registration is required for vehicle owners and operators. Discover convenient online car registration services offered by the DMV. Completing West Virginia drivers ed can enable new motorists to obtain a drivers license more easily. Learn about drivers education in WV. A West Virginia bill of sale records a transfer of ownership after a car purchase. Learn how to get a WV vehicle bill of sale from the DMV. Unpaid traffic tickets in WV may lead to additional DMV penalties. Learn how to pay a ticket online in WV quickly and easily today. West Virginia DUI penalties imposed by the DMV include license suspension and mandatory education. Get more WV DUI information. Buying a car online makes your WV DMV car registration easier. If you plan to buy a car in West Virginia, review these options first. Find a WV DMV office in your area, and get the DMV services you require. West Virginia DMV locations are available throughout the state. Don’t want to deal with the West Virginia DMV and wait in line at the their offices? We certainly don’t. That’s why we dedicated our website – DMV.com to make this time consuming issues be done in no time. We welcome you on our guide to the West Virginia Division of Motor Vehicles. Here you’ll find information that is simple to understand, and instructions that are easy to remember. Need to obtain a driver’s license or insurance for your ride, or maybe you want to know what to do in a case of accident or when charged with DUI – no problem, we provide that info and more. Check our long list of articles, all the latest news on requirements and forms to fill in. Also, don’t forget to read about motorcycle or boat requirements in case you own one. To find your desired info in a second, use the site search or the navigation section by our logo. Yes, you as a reader can be part of all this as well, and help us do even better when it comes to providing up-to-date information. Join us on Facebook, give us feedback, comment our articles… Help us, so we can help you even more.